Another week has gone by and it's time for a new weekly prompt here at Haiku Shuukan. This week our prompt is Wasabi. Wasabi (Wasabia japonica or Eutrema japonica), is a member of the Brassicaceae family, which includes cabbages, horseradish, and mustard. 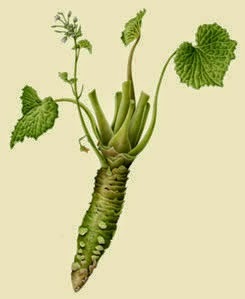 It is also called Japanese horseradish, although horseradish is a different plant (which is often used as a substitute for wasabi). Its stem is used as a condiment and has an extremely strong flavor. Its hotness is more akin to that of a hot mustard than that of the capsaicin in a chili pepper, producing vapors that stimulate the nasal passages more than the tongue. The plant grows naturally along stream beds in mountain river valleys in Japan. The two main cultivars in the marketplace are W. japonica 'Daruma' and 'Mazuma', but there are many others. I am not really familiar with this plant and I think that there will be no haiku about it. ... As I was on twitter however, I ran into a 'twaiku' (haiku on twitter) which was about Wasabi and I love to share it here. But they burn my tongue. And now it's up to you. This episode is NOW OPEN for your submissions and will remain open until next Friday October 3rd at noon (CET). Have fun!